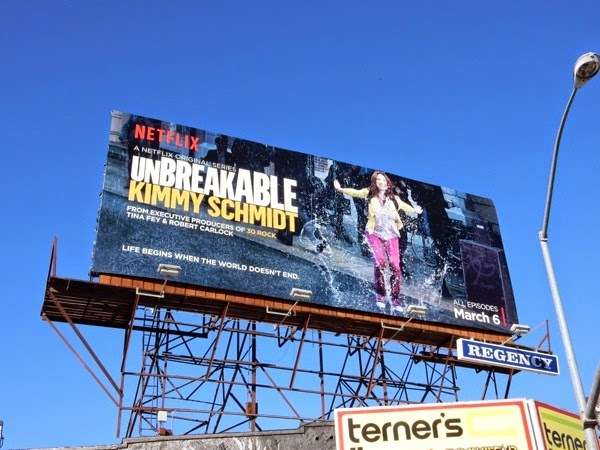 Everyone seems to be talking about Netflix's new fun comedy, Unbreakable Kimmy Schmidt, and with the infectious glee emanating from these billboards there's no wonder it's proving to be a hit. Ellie Kemper stars as the titular Kimmy who's recently escaped from a doomsday cult, she was one of the 'Indiana Mole Women', and is ready to make up for lost time by rewriting her life story in New York City. 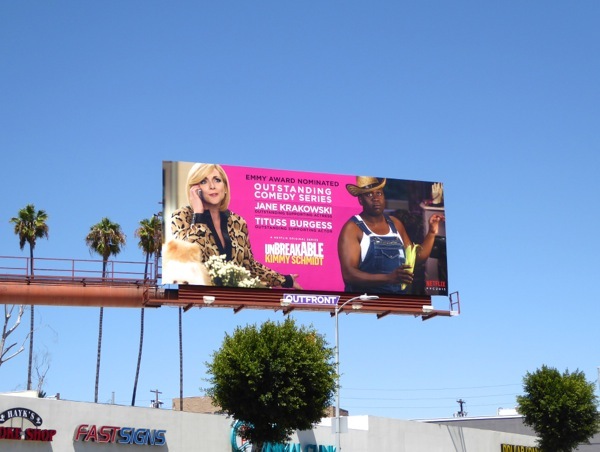 The series is the brainchild of Tina Fey and Robert Carlock, and there are even more 30 Rock connections in the form of Jane Krakowski as Kimmy's new wealthy socialite employer, who takes her on as a nanny. 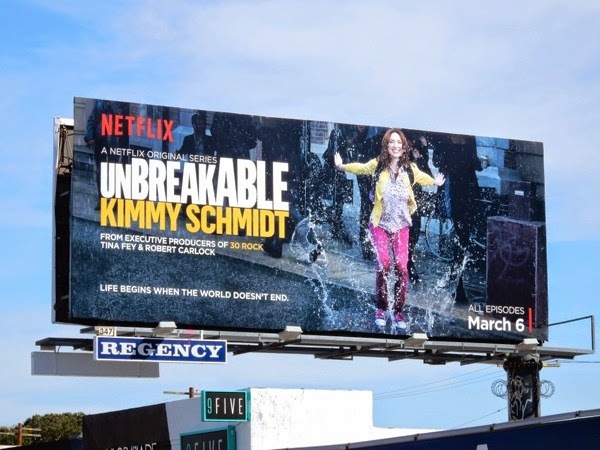 With a lot of pop culture and living to catch up on, before her past catches up with her, be sure to binge-watch the comedy with as much joy as Kimmy has experiencing everything. 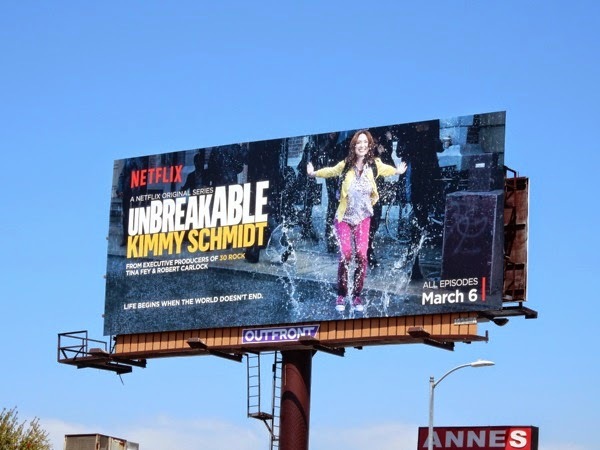 This Netflix series premiere billboard was first spied along the Sunset Strip in West Hollywood on March 3, plus later along Melrose Avenue on March 14 and La Cienega Boulevard on April 3, 2015. If you can't get enough of the actress, be sure to also check out Ellie Kemper in these Bridesmaids movie billboards from 2011. 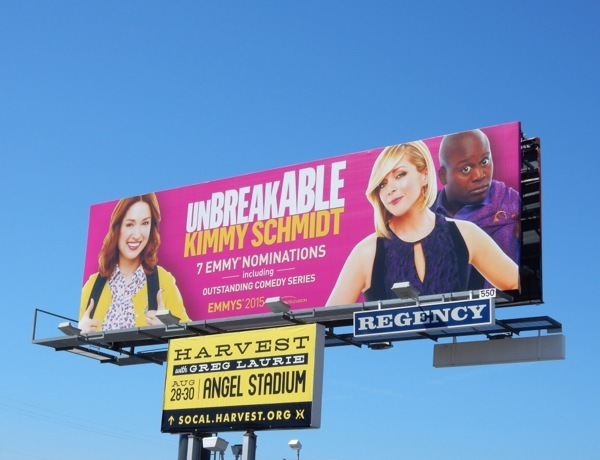 UPDATED: Here's also the colourful Emmy Award consideration billboard for Kimmy's freshman season, spied along Wilshire Boulevard on June 7, 2015. 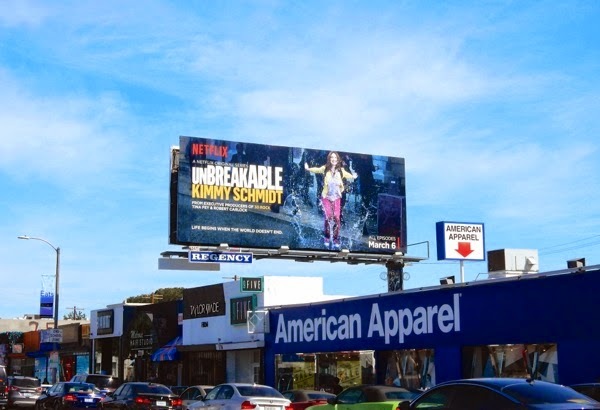 Be sure to also check out these other Universal Television Emmy billboards filling the skies of L.A. this Summer. 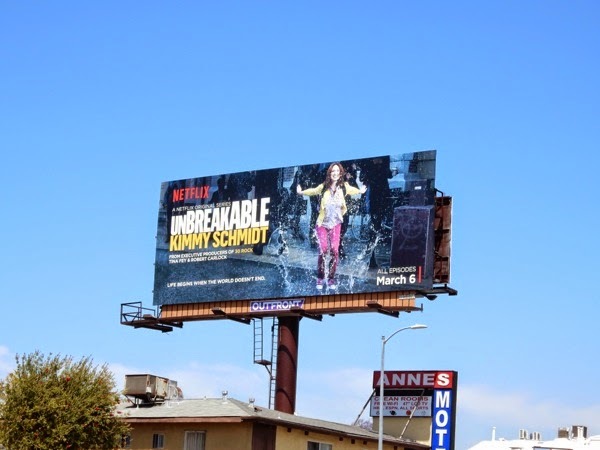 UPDATED: Daily Billboard also spied this additional Emmy consideration billboard for Kimmy, this time from the folks at Netflix. 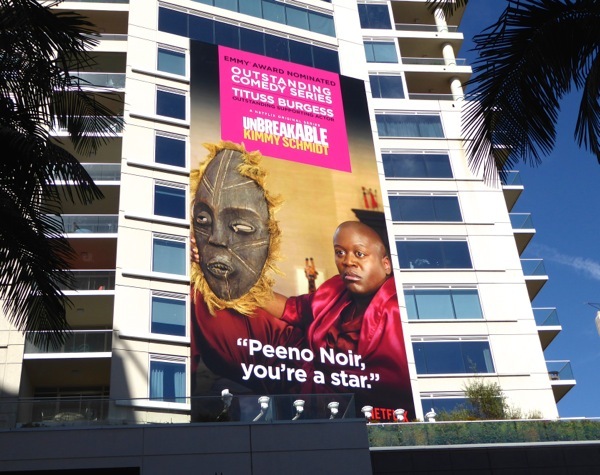 This pink ad creative certainly makes an impression with 'Titus Andromedon' (Tituss Burgess) in his Iron Man-like Times Square costume and was snapped along Ventura Boulevard in Studio City on July 5, 2015. 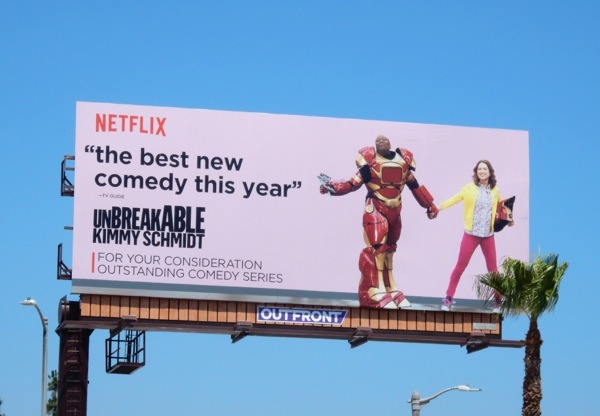 UPDATED: The freshman comedy did pretty well when it came to Emmy nominations this year, with the Unbreakable Kimmy Schmidt garnering seven nominations in total. Not only was the show nominated for Outstanding Comedy Series, but the comedy's co-creator and writer, Tina Fey, also received a nomination for Outstanding Guest Actress as an inept lawyer, whilst John Hamm received the Outstanding Guest Actor nomination for his role as the kidnapper and leader of the cult that held Kimmy and the other Mole Women hostage. 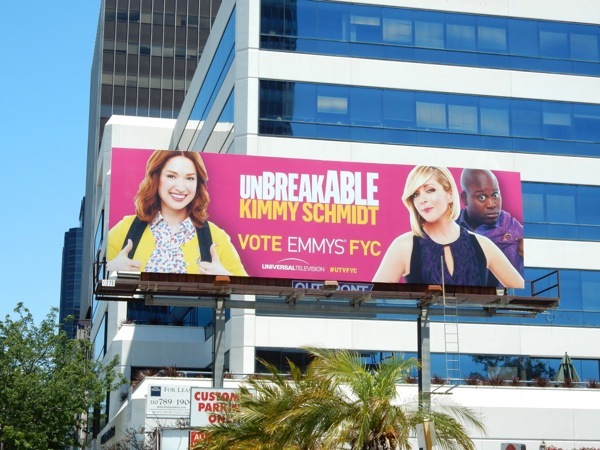 Unsurprisingly Tituss Burgess received a nod for Outstanding Supporting Actor as the dramatic Titus Andromendon, whilst Jane Krakowski nabbed the Outstanding Supporting Actress nomination for Kimmy'sneurotic employer. The show also received nominations for two people for casting, but Ellie Kemper unfortunately didn't receive any recognition for her performance as the titular effervescent heroine, so we hope she doesn't feel too left out. 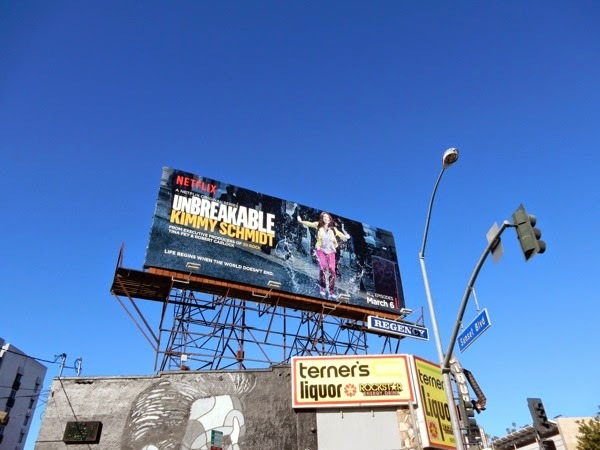 These fun Netflix Emmy nomination campaign billboards for the series were snapped around the streets of L.A. from August 8 to August 16, 2015.